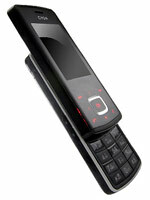 LG-KG800 is a slider mobile phone from LG Chocolate Black series. KG800 Chocolate phone features a “hidden” display which consists of touch keypads that remain unseen when not in use and will glow red when active. Other features are pretty standard with 2″ 256k LCD color display, 1.3 megapixel camera, digital audio MP3, WMA, AAC support and 128MB memory. LG-KG800 has dimension of 9.5 x 4.8 x 1.5cm and weighs approximately 85g. Check out more reviews on LG KG800 Chocolate phone.